Frances Dunkle Coffin (1922-2012) was born in a small town in central Pennsylvania and earned her undergraduate degree in chemistry at Wilson College in Chambersburg, Pennsylvania. 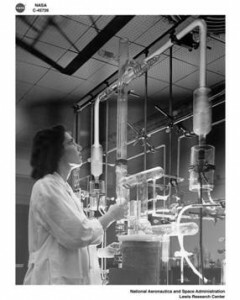 After a brief stint working as a paint chemist for the Armstrong Cork Company in Lancaster, Pennsylvania, Frances entered Cornell University’s graduate school in 1945, where she studied and worked with Simon Bauer and Richard Feynman, among others. She completed her Ph.D. in physical chemistry in 1950 with a thesis entitled “An Investigation of the Acid Catalyzed Hydrolysis of Gamma-Butyrolactone”. Frances then moved to Cleveland, Ohio to work at what was known at that time as the NACA Lewis Flight Propulsion Laboratory. (It has since been renamed the NASA Glenn Research Center at Lewis Field.) In 1951, she married Kenneth Putnam Coffin, a colleague at NASA whom she had met while doing graduate work at Cornell. While at NASA, Frances focused her research in the field of thermodynamics and crystallography. After having three daughters, she worked part time for NASA from 1961 until 1971, when she left NASA. While her children were young, Frances kept busy volunteering for the Girl Scouts, environmental causes, her local church, and the United Way. Later, she returned to chemistry, teaching classes at Baldwin Wallace College and local community colleges. During this period of her career, she was instrumental in introducing microscale chemistry to the curriculum, because of her interest in the environment. Frances died in 2012 at Kendal at Oberlin in Ohio, where she and Kenneth enjoyed an active retirement in the company of friends from NASA and Cornell. She is survived by her three daughters and by four grandsons, the older two of whom are carrying on the scientific tradition by studying mathematics and physics at college. Quote Credit: Robin Greenler is a close family friend who works in science education at the University of Wisconsin, Madison.